Does my cat sleep too long? She seems to sleep all the time. She only wakes up for food and a bit of a walk. Then she goes back to sleep again. I am worried that she may be ill and hiding it. I'd like some advice please. Admin: I can understand. Cats sleep for about 70% of the day anyway. My cat is old and she seems to sleep for ever. 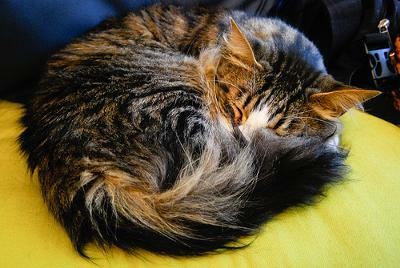 Cats will, it seems, sleep longer as they get older. Lethargy can be a sign of illness but if there are no other symptoms, extended periods of sleep are probably normal. In any case lethargy is not the same as sleeping. 70% of the day works out as 13-18 hours a day. In fact 70% is exactly 16.8 hours. Cats will tend to get up and go out when we are coming in and settling down. This is because they are crepuscular (go out at dusk and dawn to hunt). This gives them an advantage because of their specialist eyesight and animals come out at these times too. Only the possum and bat sleep more than the cat! Their long hours of sleep is due to their efficiency at survival in the wild. If you can get the food fairly efficiently that leaves plenty of time to rest in between. Also their diet is protein rich whereas a grazer eating grass has to do it almost indefinitely. Of course a lot of the time a cat is napping and able to jump into action within a very short time. My first thought is that your cat is OK but if other symptoms accompany abnormal sleep patterns a visit to the vet is indicated without delay. Ashley, I am so sorry to hear about your cat. There can't be many harder things to endure in life than the death of a pet. You are right that any changes in a cat's normal routine (what' normal for him) can be a sign of a problem. I'm over anxious with Monty and if he hasn't used his litter box by the usual time in the morning or doesn't scarf down breakfast, as is his habit, I'll get worried that something is wrong. But then he'll eat and poop and I breathe a sigh of relief. My husband just laughs at me. When we adopt a pet we know we are going to grieve for them at some point, because our pets just don't live as long as we do. Last year I remember being outside with Monty thinking how quickly the years will pass and he will just be gone. I watched him playing in the Autumn leaves and thought, "How can that be? I'm here right now with him and he's just a kitten. Surely the time won't pass that fast, because what can take this moment from us, right now?" Suddenly, it's a year later. I've been thinking also how we need to love our cats for who they are, not what we wish them to be. I want Monty to sleep at the end of my bed, but he's not that kind of cat. Too often people see their cat as a possession instead of as a living creature for whom they are responsible. When the animal doesn't behave as they expect they trade it in for a new model, as if their loyal companion has no more value than a used car or a worn out sofa. It's a hard thing to see a pet die, but at least you are being there for her, until the end. Any changes you see in your cat should be addressed to yuor vet. Even if they seem small and may be attributed to old age its better if you know. I'm taking care of my cat right now who is very ill. He is dying and its extremely painful. I wish I would have taken him to the vet sooner when I noticed some out of the ordinary symptoms. Now he is near death and sleeps all day long except to eat and go potty. He sleeps all through the night as well so if your cat shouls sleep with you all through the night take him in right away. Cats usually spend most of their nights awake and playing with occasional lying down. But most of all love them. You'll wish you had spent money on the vet after you find something you might have been able to prevent. My cat Monty hardly sleeps! I'm home a lot during the day (often all day) and he'll be up with me all day. He gets put in his own room for the night and he does sleep in his little tent bed (so cute) but he only sleeps for about six hours and he's body slamming the door to be let out. I have the one cat in the universe that never (relatively speaking) sleeps. I don't sleep well or deeply and when I finally do drift off he's scratching or banging at the door, or manages to get it open when I didn't shut it tight and then he's putting his cold nose in my face. I love him dearly, but I wish he'd sleep more like other cats. So maybe there is some natural variation, and your cat is just the opposite end of the spectrum. He's sleeping those extra hours Monty is awake for. I'd read cats sleep 16 hours a day. I have the one cat who sleeps even less than I do!